Regret only comes in hindsight. It was proven again as we sat at Alchemy Bistro Bar waiting to be served. It was lunch on a weekend, hardly the right time to hit a bar, but the bistro serves lunch, we were assured, so we figured it was a good time to go. “Ely Buendia performed here last night. That’s why I wanted you to come in the evening,” said our host, Chef Tina Moscardon. As we looked at the empty stage from where we were sitting, we could easily see how up close and personal the gig was. Damn. Alchemy Bistro Bar welcomed us with pizza. How warm can a welcome get? 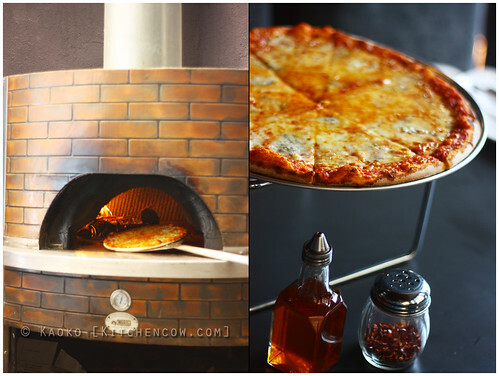 But that said, we hid our sorrows away and tucked into our Quattro Formaggi pizza instead. Served fresh from their wood-fired brick oven, the luxurious cheeses (mozzarella, gorgonzola, parmesan, and tallegio) atop the thin crust was enough to raise our spirits. Their cocktails are called potions. Are they magical, I wonder. 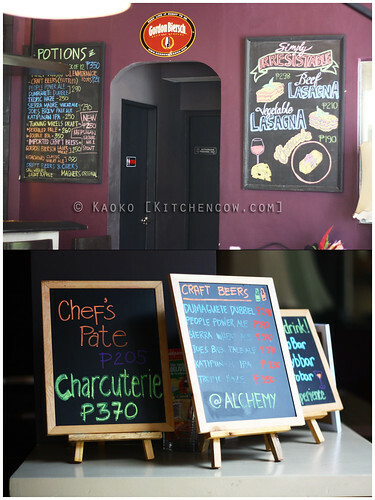 Barely a year old, Alchemy is a surprise in the residential neighborhood it’s in. Or perhaps, it shouldn’t be anymore, because Barangay Poblacion in Makati is now home to a lot of little hole-in-the-wall restaurants that sit side-by-side with the old townhouses and apartments in the area. Alchemy takes pride in its drinks—fondly christened potions—and its food. 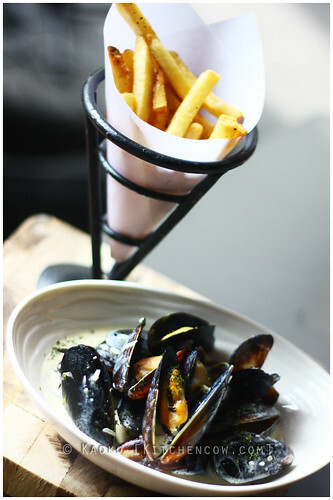 Their menu leans toward European, showcasing Chef Tina’s classical training. What I thought was fancy, Chef Tina described as a classic. For Europeans, I guess it is. Next came Spaghetti Bolognese, cooked by Chef Tina especially for the little dinosaur, and Gnocchi. As a potato fiend, I relished each bite of the tender/chewy gnocchi, making sure to sop up the flavorful gorgonzola and crispy pancetta bits. Because bacon by any other name—in this case pancetta—is still bacon to me. Mmmm…bacon. 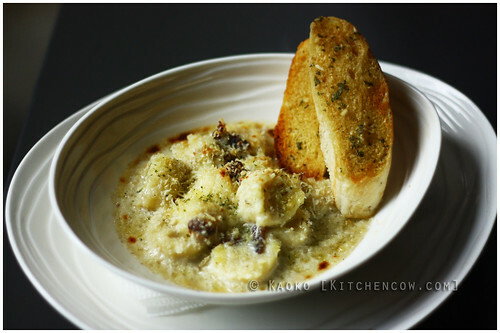 Gnocchi for the potato-loving soul. WITH BACON! As the next two plates were brought out, J and I had to take deep breaths. Did we have room for more? Turned out we did. After all, how could I not make room for the Pan-seared Salmon? 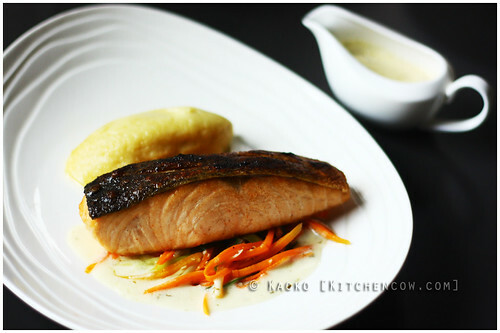 I marveled at wondrous salmon, plated to showcase the delicate crisp skin, adding a welcome textural play. The fish was complemented veggies, mashed potatoes, and a generous helping of dill butter sauce—so sauce fiends could have as much as they want. Slow-braised for 48 hours. Wow. Just. Wow. On J’s side of the table was an eye-popping whole Slow-braised Lamb Shank. 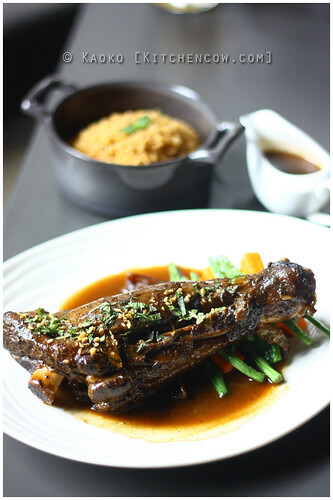 Chef Tina regaled us with stories of lamb-hating diners who made an exception for her lamb shank. Slow-braised for 48 hours, the Mediterranean flavors and fork tender meat was a pleasant surprise. It definitely was not like any lamb I had before. A chiffonade of mint gave it a refreshing kick while a serving of couscous carbed it up. By the last plate, we were so stuffed that we had to pass on dessert. Well, except for the dinosaur who had ice cream, but kids have a second stomach for dessert, don’t they? Eating at Alchemy was a really pleasant surprise. Without the live music and bar hopping crowd, it was an honest-to-goodness restaurant run by an honest-to-goodness chef. 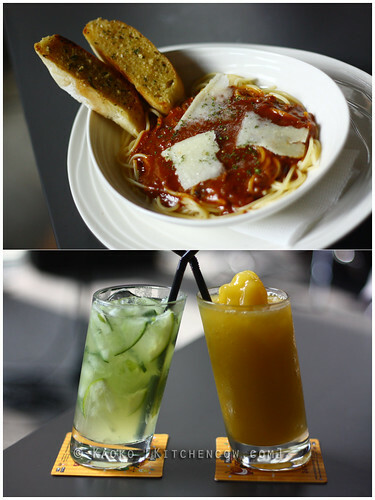 Its extensive menu requires return visits and the laid-back atmosphere makes it perfect for long lunches. Especially long lunches with margaritas on the side. Kitchen Cow was invited for a complimentary preview lunch. No compensation of any sort was received. Text, photos, and opinions are writer’s own. This entry was posted in food & cooking, where to eat. Bookmark the permalink. The lamb shank looks delicious. I’ve always wanted to try it but never had the chance. I’ll try it this weekend!